This stunning Victorian Gothic former mill owner's house is set in thirty-six acres of parkland and ancient woodland. The home of George Sheard from 1875-1902, the house became a museum in 1911 and was named after its first curator, Walter Bagshaw. His daughter, Violet, continued to travel the world and bring back items for the museum until she was over a hundred years old! The collections include a wide range of exciting and unusual things from around the globe. Travel the world and visit Ancient Egypt, South Asia, the British seaside and last but not least Batley itself - all under one roof! Where else could you find a golden eagle, a mummy's hand, Chinese dragons and a vulture? The museum boasts an atmospheric gallery of Egyptology known as The Kingdom of Osiris. This uses dramatic lighting effects to recreate the atmospheric interior of a tomb. The South Asia Gallery full of artefacts brought to Batley by Bagshaw in the early 20th century, and the Gods, Divine Creatures and Mythical Beasts gallery, which showcases stunning decorative arts from China, India, Japan and Africa. And it's not just the far away that fascinates. The local history galleries explore Batley's rich history through peoples' stories as well as through the institutions and cultural life of the local area. You'll find that Bagshaw Museum is a very surprising place. Ask for more information about the year round events, temporary exhibitions and education programme. From M62 junction 27 follow A62 towards Huddersfield. At Birstall, follow tourist signs. 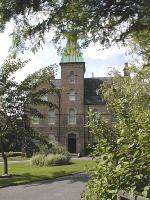 Bagshaw Museum is approached through a small housing estate. For the latest bus information telephone Metroline +44 (0)1132 457 676. 10 minute walk up hill through Wilton Park to reach the the museum from Bradford Road (A652).